Meanwhile the universe is interesting, delightfully interesting even, and I apply and dedicate my awareness and interest to that end. I assume, generously and with scant evidence, that it is a Good Thing to Have Understood, or at least to have Striven to Understand. I don’t know if that is in fact true, it seems quite likely that it isn’t, but it also seems a fine and possibly even wonderful conceit to live under. That the answer is complex. Primarily I see it as a function of cognitive ability. Oh, not in any elitist or superiority sense, but simply in terms of capacity. Tic-tac-toe is a fine game for younger children as they simply don’t yet have the cognitive abilities necessary for recognising what’s necessary to remove the game. It is rather less interesting if you or I played it. Similarly, the game of Go is very interesting for people precisely because we don’t have the cognitive capacity to remove the game. In short: in order to be a game the system as presented must fundamentally exceed our ability to comprehend the system. How it exceeds us, by complexity for instance, or by stressing analytical forms we humans are inherently weak at like conditional probability, or by requiring modes of thought that we’ve not yet fully developed (and thus a lot of games for pre-adolescents stress symbolic thought as they’ve only just developed that capacity (it comes in around age 11)) – how it exceeds us really doesn’t matter, just that it exceeds us and is hauntingly close to the apparent edge of our capacities so as to provide the taunting illusion of almost-graspability. And it will remain a game only to the point that no matter how hard we study and analyse and work it, that we will still not fully understand the system represented or implied by the game. Now a kicker in this is that most games rely on the fact that as humans we cannot completely model another human (of comparable capacity to ourselves). Godel’s incompleteness theorem guarantees that, and provides the primary reason I rarely ever play 2-player games. The problem here is that the modelling problem is also a cheap out for lazy game designers (ahem – there’s no subjectivity in this declaration, no sirree!). In this I find that the more interesting games exceed their players in both their systemic demands and in their demands of modelling the other players (and thus in the intersection of multiplayer interactions and the system, an implicit third factor). After that basic, well, it gets murky and subjective and ever so much more complex. A lot of the subjective preferences there are arm-wavingly discussed in my profile text here on BGG. And, not to short shrift you too badly, I need to get ready for a gamesday with one of the top 18xx players in the world (Todd vander Pluym) who is in the area for a few days…and fascinating as this question is (and it is truly interesting), that’s a time-bounded opportunity and this question isn’t. Sorry. I find that face-to-face games provide context and variety which is largely not available in solo study. That alone more than makes face-to-face play worthwhile. Just participating in a game with other actors, and observing those actors, actors not in my mind, suffices a lot of my requirements for playing a game as you say. Much of anything I may think during that time or later will be catalysed and informed by my observation of those actors during the game – which is the great thing about playing games rather than merely thinking about games. Clearly some, most, all(?) 18xx games are mixtures of the four camps in various degrees and at various times during a given game. The private sales to companies in many games is a free-money element, but so are destination runs with multi-jump stock increases and the extra 40%-50% in free capital given when floating companies in full-capitalisation games. The mergers in 1817, 1824, 18EU, 18C2C etc are clear plug-things-together moments etc, but so are the synergies between privates and majors in 1846, 18C2C etc. The portfolio management of the 1825s, 1853 and the like fall out cleanly as timing games, but 1826’s focus on getting the right trains into the right companies arguably does too. Few if any interesting 18xx seem to be purely any one of the above meta-types, rather they move and shift focus across a balance of those points over the course of the game. Amusingly, 18xx players can also be classified across the above four criteria, and like the games, the Run Good Company players are considered the least interesting and the Free Money players get all the despairing head shakes. Fast trains: Some games tend to focus on train rushes, and coming out on top after the dust has settled. The key metric is how large a fraction of the purchase cost is the typical run value and how many times they’ll run. 1843’s trains generally need to run three times in order to cover their purchase cost, but will often only run once or twice before rusting. Another key metric in this space is whether trains sometimes rust before they ever run. This usually means that the key decisions in the game are made leading up to the early cheap permanent trains. 1830, 1841, 1843, 1849, 18Mex etc all tend to feature blistering train rushes (though 1843 skips the cheap permanents bit). David G. D. Hecht designs (as a broad for-instance) tend to have rather sedate/processional train progressions. Low or high income: A basic measure of how rich the game is, especially as a function of train purchase and company floatation prices, but it can also be as a function of more basic operational costs (eg tack-laying costs). 1830 is the most notorious example of a low income game, but 1849 gets in there too. 1843 tries to be a low income game and often is. 18C2C and most of the Double-O Games designs are high income games. Tile manifest: Are the tile limits a significant function of Good Play? 1830, 1843, 1849, many of the Wolfram Janich and some Double-O Games designs fall into this camp. In other games, the tile manifest is explicitly generous, or at least rarely if ever a consideration in Good Play (1817, 18C2C, most-but-not-all David G. D. Hecht designs, etc). Stock appreciation vs dividends: Which is more important: dividends and cash in-hand or stock appreciation? 1830 is the grand-daddy of stock-centric games with 70+% of player scores descending from stock appreciation. Most Mark Derrick designs are heavily cash/dividend focused. Certificate limits: Are key strategies in the game focused on managing certificate limits (yellow fever, forbidden forest, variations in share density, number of presidencies, etc). Most any game with a classically coloured stock market falls into this camp with 1830 and 1870 being the two most notorious examples. 1817 plays in this space with share densities and thus the balance between stock appreciation and dividends. Liabilities: Are investments possibly significant liabilities? The classic form of this is the potential requirement to buy a train out of pocket. Not all 18xx have that property (eg the 1825s, 1860 etc), and several of the Double-O Games titles feature not-very-onerous loans which smooth the edge there. The 1825s, 1853 and to some extent 1860 conversely impose no requirement for companies to own trains, just financial hiccoughs if they don’t. Balance of share values: Which is more important, owning the best shares or owning more shares? Does that change over the course of the game? 1846 for example is notable in being readily won while still not at paper limit – it is a game in which owning better shares is commonly more important than owning more shares. Conversely 1830 is the poster child of owning more shares typically defaulting to being better than owning fewer better shares. It is worth nothing that the shape of the stock market does not feature anywhere in this list. 2D and 1D stock markets are effectively identical, just with rather more complex price movement rules for the 2D markets. Players auction for turn-order before discarding their hands down to 3 cards. First to pass will go last, second to pass will go second to last, etc with the last remaining bidder going first. Winning bidder pays their bid, all other bidders pay half their bid rounded up, except for the player last in turn order who pays nothing. After the turn order auction, players reseat in turn-order order. Players keep their initial hands of action cards face-down on the table before them (but may of course inspect them freely). Drawn cards which are kept in the hand are put face-up on the table before them. All played cards in the discard piles may be freely examined and counted at any time. In addition to the three cards for the action draft, also lay out the next three cards, face up, that will be drawn to replace drafted cards. Stock-trashing in 1830: Is it actually necessary for Good Play or is it merely gratuitously abusive? This came up recently in both our 18C2C game and in an 18FR-RCE game a couple weeks before. I’ve no doubt it will come up future games as well. In both the mentioned games I set about trashing the stock-market (often buying shares and then selling them at a loss and so losing money) and several players complained that I was just being unnecessarily negative and wasting everyone’s time with an overly long and uninteresting Stock Round, when in truth a lot of my later success in those games was due to the fact that I’d stock-trashed so heavily (and taken the loss) earlier. Yep, if I hadn’t stock-trashed, I would have come in dead last rather than competing for the win. The primary keys to the value of stock-trashing1 mentioned, are return on investment (ROI) and liquidity. It will take a little bit to explain exactly how, so bear with me. Imagine a game of 1830, perhaps a 5-player game. The game starts, the private auction happens, and you get…nothing, or maybe only a really small private company. Everyone else has nice big private companies and everyone (who can) is going to float a major company. You will float a major company too, but they’ll be getting nice big revenues from their private companies and you’ll be getting what, a few more shares and their piddly revenues and meager stock appreciation to match? Key point: You’re already losing the game. Yep, you are already losing. Think about that. You’re already losing the game. The game has just started, and you are losing. If you let this continue, you will in fact lose. That is, or should be, utterly unacceptable and you’d better do something about it right now. You need to win! Right now you have more money than they do, but they are making money faster than you are, and pretty soon they’ll catch up and pass you as they sell their private companies into their major companies. At that point the game is history and you’ve lost. If you’d like to compete for the win, and I assume you are playing for the win, then you’d better change something and change it fast. Going on wanly hoping isn’t going to do it. The winning players certainly have no interest in changing anything as they’re already winning (or at least contending for the win). You are losing, so it is up to you to change something so that you can win instead, and this is where stock-trashing can come in. But before we get there, we’d better understand a little more about how and why you are already losing, because you are most certainly already losing, and losing badly. At core you are losing because your money is not working for you as well as their money is working for them. Sure, you can buy more shares than they can, but their private company revenues have massively better returns than any share you can buy. What they’ve invested in is simply better than what you’ve invested in, and they’ve got more of it than you do. Even better for them and worse for you, in a few more turns they’re going to be able to sell their private companies into their major companies, pulling out gobs of money, and they’ll use that money to buy even more shares than you can! Their money is not only working better than your’s, but they have a great wad of free money just sitting there waiting for them to take it! You don’t have any of those advantages, but they do! Thus, you are losing. In the classic form they’ll sell their private companies in for massive money and then immediately sell down (or even better dump) the company they just looted, adding all that wonderful stock-appreciation they’ve made in the meantime to their dividends and private company money, and then they’ll float a brand new company for a nice high par and never even bother to look back. If someone wants to take their old company, then they’re welcome to it as it has crap trains and no money2 They’re interested in their bright shiny new company that’s full of bright shiny new money! That classic form is not good for you. Sure, it is good for them, but I really hope your goal in the game is for you to win, not for them to win. So, you’d better change something, and this is where stock-trashing can usefully enter. The core problem is that their money is working better than your money, and you have to change that. One of the things you can change is stock-appreciation. If after they loot their companies when they then want to sell those (now crappy) shares in order to buy bright shiny new shares in a new company full of money it turns out that you’ve already trashed their stock so they have no stock-appreciation…well gosh, their money isn’t working for them so well any more, is it? You’ve killed their ROI (stock appreciation). And if you also just happen to have left the Bank Pool full of their trashed shares so that they can’t actually sell much into the market, well, you’ve clipped their wings even more as you’ve killed their liquidity (ability to sell shares to raise capital). Oh, and that new company they float? How about you stock-trash that as well, really beat the crap out of it? They bought $600 worth of shares in floating that company. If you can beat it down hard enough, that $600 worth of shares will now only be worth $300 or less (perhaps given a little help from the other players). Again, now their money isn’t working for them so well any more. Sure, they’ve got control of $1,000 in bright shiny new capital – you can’t solve every problem all at once – but it is going to take a long time to get that share-value you destroyed back. But, even better, you’re probably going to be able to buy those shares you trashed back again in the next stock round pretty cheaply as they won’t have appreciated much! You buy the shares, you trash the shares, you wait a set of ORs, then you buy most of them back again on the cheap in the next Stock Round. Now your money is starting to work for you better than their money is working for them! What makes this a little more interesting is that many good players will buy/sell the last (6th) share of a company they’re floating. They do this in order to dissuade the stock-trashers waiting in the wings (it now costs money to stock-trash as the par is higher than the stock price), but also so that they can then use that money to buy a share that will be paying better than their new company (their new company will miss at least one dividend as it has no train). Someone may also flip a share or two into the market while you’re building up your portfolio to dump, thus costing you even more money as you trash the market. The costs to stock-trash can be high. How much is stock-trashing worth to you? How much is it worth to your position to beat them down? Is it worth buying 4 shares at $67ea and sell them at $65ea, losing $2 each? What about buying shares at $100ea and selling them at $90ea, losing $10 on each one? Or buying shares at $100 and selling at $82? There’s a judgment call here on how much loss is acceptable. There’s a point at which it is simply too expensive, but how much is too little and how much is too much? Not biting the bullet will lose the game, but losing too much money in stock-trashing will also lose the game. Finding the right middle ground is key3. You’re going to have to lose money, to deliberately throw money away, in order to slow them down and to rescue your position, but how much money should you throw away and which stocks should you trash and how much? If all goes perfectly (unlikely) you’ll convert an obviously losing position to a competitive position, but doing that is going to cost you some of that money you so desperately need. More likely you’ll convert a losing position to a merely weak position, and then you’ll have to fight again, and again in later stock rounds, beating and thrashing the stock-market, taking losses as you do so, until you’ve caught up and pulled them down to your level. It won’t be cheap, or easy, but if you do win, you’ll have earned it by tooth and claw from the ground up. But then isn’t the answer then to just make sure you always get some good private companies and thus bid whatever’s needed to get them? No. Pay too much and you’ll never get it back4. The guy without any private companies will stock-trash, you won’t get your money back from your over-large bids, and you’re losing yet again. There’s a balancing point, and it is hard to find and balance correctly5. Also, won’t everybody just stock-trash, turning stock-trashing into a shared pathology that makes no net difference? Yes and mostly no. Stock trashing sacrifices opportunities. You’re buying bad shares or passing on doing any actions while the other players snap up the good shares. Do that too much of that and you’ll lose as well. Also you’re making good shares cheap, and the other players are going to buy some of them (at their new low price) – so you’re helping as well as hindering them with your stock-trashing. Getting that balance right is not easy. In short stock-trashing is a necessary thing, but also a fairly subtle and highly contextual thing. Also, remember that stock-trashing is not your only weapon. There’s also track and the train rush to consider among others. 18xx players have many offensive and defensive weapons to choose among. Stock-trashing is just one. Three company dumps in 18xx are frequently discussed but far less often successfully executed. They are hard to pull off well. Additionally, according to my email, there’s also a fair bit of confusion on how to arrange a three company dump. You are the president of CompanyA, CompanyB and CompanyC. When CompanyB runs it has no train and has to buy one. CompanyB doesn’t have enough treasury to buy the train for that much, and neither does the CompanyB president, so the CompanyB president sells shares in CompanyC to fund the train, sufficient to dump CompanyC on another player (who holds at least two shares of the company) in the middle of an Operating Round. You’ll have to flesh out the details of how to arrive in this minimal state, and what related conditions you want to be true when you do. Presumably one of the pre-conditions is that CompanyC doesn’t (or won’t) have a train. Getting all the details right is tricky. In several hundred 18xx games, I’ve seen two well-executed three company dumps. A well-executed three company dump can be devastating to the player the company is dumped on, especially if it lands them needing to buy a $1,100 diesel they were unprepared for (as it was for me in one of those two cases). The company selling the train (usually) can’t be the one being dumped as the sale/control-transfer happens before the presidential authorisation for the train sale and the new president is unlikely to authorise the train sale. Some games explicitly disallow three company dumps. Check the rules for the game you are playing. The games that disallow, usually do so by requiring that forced train purchases must be from the bank and not from other companies. 18EZ is marketed as an easy entry path into the 18xx for players new to the 18xx and without an experienced 18xx player to guide them into the field. The stated hope is that new players should be able to pick up the box and be easily and enjoyably playing an 18xx-like game without great effort or a large time commitment. A key point here is that I am not in 18EZ’s intended audience and am partially incapable of reviewing the game for that reason. I run a monthly 18xx group and play 18xx often. As an experienced player, I teach 18xx to new players every month1. I have a reasonable idea of what it takes to guide a new player into the 18xx and can support that notion with direct and recent experience on both sides of the student and teacher fence. But, I’m no longer qualified to comment on the new-user never-played-an-18xx-before starting-from-scratch experience, the experience of a brand-new player faced with an empty table and expectant players who want to find out what this 18xx thing is all about. I’m a bit past that now. Does it succeed in providing a system for new players to ease into and learn the 18xx so that they can then reasonably move on and play the other games in the series? Is the learning course that 18EZ provides sufficiently attractive as a game or as a set of games to maintain the interest and be thought worth playing by such potentially new 18xx players? 18EZ consists of three games: Level-1, Level-2 and Level-3. Each level builds on the one before, in sum providing a sort of ladder of increasing complexity which in toto introduces most of the 18xx concepts. Somewhat akin to the basic game included with 1856 and 1870, each player players runs a single company – there’s no distinction between players and companies – laying track, and running and buying trains. This is a rapid, relatively labour intensive exercise which introduces the concepts up track upgrades, train rusting, and running companies for money. Level-2 introduces the distinction between players as investors and companies as investment targets, the stock-market, company floatation, capitalisation, shares, dividends, placing stations (one extra per company), certificate limits, train rusting, forced train purchases, and having the game end on a bankruptcy or breaking the bank. Level-3 finally attempts to deliver an 18xx game, adding private companies, an 1830-style private company auction, half-dividends2, minor companies which merge into a major company on the first 5-train purchase, and more station markers. The Level-2 game is similar. The map is mostly symmetric and thus entirely lacking in positional texture. With small variation, anything interesting accomplished anywhere on the board can be replicated in each of the other sectors for similar effort and rewards. While this quality is good for learning, it is less interesting as a game-quality. There are a few small shortages in the tile-set, mostly in the simple yellow-tile upgrades. but they should rarely make an appearance or have a significant effect. What is left is a little dance around priority, operating order, and the key question of who gets to buy the first 3-train and the first 4-train (to rust the 2-trains). Game-wise, again, there’s little here4. There’s very little ability for players to differentiate, even less reward for them differentiating, and the handling of stock value and capitalisation is fundamentally broken (more on this later). Due to its greater complexity, there’s more to the Level-2 game, but there’s little if any extra game-value, just more moving pieces. Like Level-1, Level-2 is a game of going through the motions as an exercise in building familiarity. There’s no texture, no differentiation, and no character for the player’s to exploit and build positions around; just a system laid out for the players to become comfortable with. This time however, due to the additional complexity, I can understand new players playing for a while, perhaps even finishing a single game before quitting in exasperation over looking for the game. I’d be surprised if any ungoaded player willingly put them selves through more than one game of Level-2. Level-3 is the presented as the Real Deal for 18EZ and is also where the main problems come into sharp relief. Most of the new materials added, like the private companies, are pretty ignorable5. There are two problems, one introduced in Level-2 (but not such a problem there due to the general lack of game at that level), and the other brought in newly with Level-3. The resulting exercise teaches almost as many bad lessons as good, while continuing to have few grounds for interest as a game. I would expect new players to struggle through Level-3, thinking they’re learning the ropes, perhaps even for 2 or maybe 3 games at the outside, before giving up in exasperated exhaustion. As written, there’s just not enough game. In Level-2 and Level-3, companies float as soon as 5 shares have been bought out of the IPO set, with the resulting companies starting fully capitalised6. As with other 18xx, stock prices fall one row for each share sold. Like 1826, 1832, 1846, and 1870 and a few other 18xx, shares in the IPO pool pay into the company treasury. However unlike those games, companies in 18EZ are not allowed to buy back their shares from the Open Market (and can’t issue their shares to the Open market to raise capital – but that’s a lesser point). This is a severe and even crippling problem. First, some background: The 18xx are games of capital management. They are capitalist wet dreams. Oh there’s the whole business of companies and trains and track and stations and tile upgrades and stock prices and what-not, but that’s all just frilly distracting glamour on the core of the game: management of capital. That’s all the players do really: they manage capital. They invest that capital in shares in order to earn dividends and stock appreciation, thus adding to their capital. They float new companies so as to gain control of yet more capital via capitalisation, and then leverage that larger controlled capital into accelerated growth of their own capital. They manipulate the market and the trains and all that other palaver so as to minimise the risks to their own capital while maximising the risks to other’s capital. They manage capital from the moment the game starts until the moment the game ends, and they measure their success (score) in the game by, yep, measuring their total capital. The 18xx are games of capital management. The problem is that 18EZ allows capital to be destroyed without any recovery, and that prevents capital management in any useful sense. In a standard 18xx, like say 1830, shares in the Open Market pay into the company treasury. While this may be somewhat counter-intuitive, it provides a reward and recovery path for a company that has had its share price trashed: all those Open Market shares are now paying their dividends into the company, capitalising it, and increasing its viability as a company. Thus the director of a company whose share price is trashed may wince, but they also appreciate the resulting influx of capital as those shares pay into the company treasury. The company is weaker…and yet stronger, and that trade isn’t such a bad one. And, most importantly, company presidents are able to manage their company capitalisation via keeping shares in the Open Market7. In all the games I know of that have IPO shares paying into the company treasury, the game also allows companies to buy back their own shares (at the new low market price) and thus still receive the capitalistion benefits of the shares8. In this way a company director in those games can directly manage his company’s capital and capital income. In 18EZ Level-3 share shares reduce stock price, just like normal9. Additionally shares out of the IPO market cease paying into the company treasury. The result is that it is in every 18EZ player’s interest to move all their competitor’s shares out of the IPO market and into the Open market as fast as possible, thereby not only destroying their opponent’s share value, but also destroying the ability to further capitalise the company without withholding. There is no risk to a player in destroying another player’s share value in this way. There’s nothing but upside: the other player’s net-worth (ie score) is reduced and their companies are greatly weakened due to lost capitalisation ability. All with no cost or risk to the trashing player! This free supply of You_Lose! activity is not present in other 18xx, and for good reason: it encourages pathological and abusive behaviour. In short, 18EZ’s pattern, which directly encourages share trashing without any value return for the destroyed capital value, encourages abusive and pathological behaviour. Once past the 3rd Stock Round, the primary incentive of every player is to ensure that all his competitor’s share-prices are pushed down to the floor – and he can do that very easily and with no cost or risk to himself. 18EZ also teaches players to withhold regularly, frequently, as the only way to capitalise their companies once they’ve run through their early train money. This habit is death in a normal 18xx. The base 18xx pattern10 is that players should never withhold dividends unless it is either with their trailing/trash company11 or the company can thereby immediately buy a permanent train after withholding. 18EZ’s effective insistence that further capitalisation is only possible via withholding (combined with the flat stock market) directly encourages players to withhold frequently; a habit that will sink and damn (and befuddle) them in almost every 18xx game they later play. The big problem is that these traits destroy much of the value of the game as a teaching tool. The game as currently written teaches its players to play badly, and to make the wrong decisions for the wrong reasons, thus reducing their ability to play other 18xx games until they un-learn the bad lessons 18EZ taught them. It does this by rewarding them for playing badly. It teaches them that capitalisation control is non-existent, and it isn’t, not in every other 18xx. It teaches them that stock trashing is free, obvious, and carries neither risk or penalties, and that’s simply not true in every other 18xx. It teaches the new players that having your stock trashed is an unmitigated bad with no possible upsides, and that there is nothing you can do about it except suffer, and that too is not true in every other 18xx. It also teaches new players that capitalisation is fixed, that there is no such thing as creative capital destruction12, and that capital under control is actually an almost completely illiquid quantity, and yes, that is just not true in every other 18xx. Finally, it teaches players that there is little to no penalty for withholding dividends, and that managing withheld dividends and capital across companies is mostly unimportant, and yes, that’s also not true with every other 18xx. I expect an 18xx-teaching game to teach new players good habits and patterns of thought regarding capital management. Or at the very least, not to teach them bad habits and sloppy thinking that will kill them as soon as they step into a real game. 18EZ fails on this score. 18EZ’s stock market is a model of equilibrium. Every stock-appreciation delta is $10. It doesn’t matter where the stock is in the market, right or left, up or down, the deltas are always $10. This seems nice and simple, and it is, but it also loses a key value of the 18xx: the rewards for getting a stock’s price marker to the right. In a typical 18xx stock market, the stock-appreciation for shares far to the left can be but a few dollars. However, if a stock manages to get to the other side of the stock market, far to the right, then a single price-appreciation step may easily add $50 to a share’s value, rather than the (say) $3 for another share far to the left. The varying rate of stock-appreciation across the stock market is the foundation of several core lessons and principles of 18xx. As roughly 70% of a player’s final net-worth (and thus score) in a typical 18xx game is the value of their portfolio, getting high share values for their companies and thus having their portfolio stuffed with high-appreciation shares is critical to successful 18xx play13 – but 18EZ loses that lesson in its entirety by having a flat stock market, and the result, again, is that 18EZ teaches its players bad habits and poor decision-making processes. Instead of IPO shares paying into the company (which is the more rare form), have shares in the Open Market pay into the company (the more common form). Stay with only IPO shares paying into the company, but change the capitalisation of companies from full capitalisation (100% on float) to incremental (as each share is bought from the IPO pool its purchase money is added to the company treasury), and also allow companies to buy back their shares from the market during stock rounds (putting them back in the IPO pool) as well as to sell their own shares into the Open Market to raise capital. Both approaches work, both approaches restore the capital balance of the game, and best of all, both approaches teach new players that they can in fact predict and constructively manage capital into the future. The players learn the right lessons. The first form is simpler and perhaps more obvious for new players. The second address is more complex and allows for a much larger range of creative options, but may be thought too confusing for new players (a fair complaint). Happily there is definitely still time available for a rules-errata and all the above fixes can be made easily and even fairly cheaply. 18EZ almost works as a teaching-game. It has most of the right basics together, but a few critical flaws prevent it from succeeding. However even with the flaws fixed, it is difficult to see 18EZ ever being more than a somewhat laborious exercise rather like the Geography games played in High School, which while they were certainly educational, were also abysmal games. With the fixes, as a $45 exercise to be done a few times just to learn the 18xx, 18EZ will probably work fine. At this level it is effectively paid-training that is discarded once it is (rapidly) surpassed. The problem with such paid-training is that it had also better be enjoyable or most of the audience will abandon their good intentions early rather than drudge through15. This is perhaps the main area where 18EZ falls short as a game. It is, pardon my candour, almost inescapably boring at all levels simply because there is no differentiation, no texture, no character, and no significantly unique qualities to player or company positions, and it remains at heart a training exercise that feels more like a training exercise than a game. Even with fixed capitalisation and a graded stock market, the game remains abstract and texture-less. The very genericy that makes it easy to use as a stationary bicycle to learn how to pedal, also removes the differentiation and character that are the keys to human interest. Most 18xx games are tightly tied against both a specific period of history and the specific terrain of a certain part of the world. That simple aspect of realism, of relation to the player’s world, does a lot to resonate with players, even if they don’t know that period of history or that part of the world well. Some of the names ring bells, they understand mountains and rivers and lakes, they kinda sorta see why there might be cities in some of the locations just by the geography and their faint memories of skipped history lessons, and all the names of companies and locations ring with echoes of the culture and language of that time and part of the world. While a subtle effect, it is surprisingly emotionally powerful, and 18EZ not only loses that, it also aggressively devalues it, and I don’t think that double-whammy can be recovered from. Note: David Reed’s Geocities page, frequently linked and quoted below, will be disappearing as Yahoo! shuts down Geocities. Thus, those links will break, and also in part, my rush in getting this page and the related files assembled. Take a Ride on the Reading by Alan Moon, published originally in The General volume 23, number 6 (and due to be republished in the Train Gamer’s Gazette volume 2, number 4), added the Reading Railroad to the game and suggested several other changes to the rules of play. I’ve assembled a PDF of the rules for the Reading Railroad Variant. Source files for the new track tiles and shares may be found here and here. The Coalfields by Alan Moon, published orginally in Games International number 6 (and recently republished in the Train Gamer’s Gazette volume 2, number 2), added the Norfolk and Western Railroad; an extra portion of the board; two “7” trains; off-board connections that can be the center of a run, instead of the end; and suggested several other changes to the rules of play. including rules for combining The Coalfields with Take a Ride on the Reading. I’ve found two supporting archives, fortunately non-contradictory: one and two. The former has the advantage of providing both the new rules and colour images for the new map sections, tiles and shares. Update: Please note that the colour PDF I’ve assembled above for the Coalfields expansion prints the map extensions slightly too small. It doesn’t accurately match the 1830 map. The resulting map sections, while undersized are certainly playable albeit also ungainly and clumsy. Oddly the track tiles that go onto the board are however just fine. The track tiles placed by players appear to be small by a similar fraction to the map extensions. I have not yet determined why this is true, or what the correct scaling factor is. I estimate by rough eye that it is not far under 10%. The Pere Marquette by Federico Vellani, published in the Train Gamer’s Gazette volume 3, number 1, adds a new western railroad. I’ve stashed a PDF of a photocopy of the original magazine article documenting the new company and related rules changes. The 1830 Debt Variant by John Puddifoot, published originally in the Train Gamer’s Gazette volume 1, number 3, added the ability for companies to go into debt (similar to, but not exactly like the debt rules in 1856). I’ve assembled a PDF of the rules for the Bonds/Corporate Debt Variant. The Chesapeake Bay Bridge by Carl Burger has not been published anywhere yet, to my knowledge. It adds on to the Coalfields variant. A bridge between hexes J14 and I17 is the only added terrain. K15 (The N&W base) is now has room for two tokens, and its value changes based on phase from $30 to $50 to $60. Two tiles are also added: one each of tile 145 (from 1870) and 220 (from 1835). I’ve been unable to find any further details. The “Simple” 1830 variant by John David Galt adds the Chicago, Milwaukee, St. Paul, & Pacific (CMSt.P&P - The “Milwaukee Road”) starting with 3 tokens in hex D2 (Flint MI) and the Louisville & Nashville (L&N) starting with 3 tokens in hex H4 (Dayton OH). Both companies have standard 1830 share set-ups (President: 20% and 8 x 10%). The third “6” train should be used, but no other trains should be added. These should only be used with 5 or 6 players. The variant also adds a couple of gray tiles, which will be available when the first six train is sold. The first is a tile identical to the Toronto tile in 1856 for New York City; the second is a “B” tile (two hole city with five exits, worth 70). Only one of each of these tiles is added. What’s up on that long-dead site is all there is. The variant was nothing more than a one-liner response to someone on the 18xx mailing list who wanted an 1830 variant with more companies. I’ve been unable to find any further details except for Keieth Thomasson’s mention listed below under the Nickel Plate variant. The 1830 Variant Box No.1 is just enough information to intrigue but not enough to give any idea what this actually contains. This is published by Wolfram Janich and contains the Wabash Cannonball Variant by Harry Wu, the ‘Simple’ Variant by John David Galt. The rules to these are in German and English. There are also two alternative maps by Wolfram. This introduces a new company, the Wabash Railroad, which starts in hex H2. The map is extended to the west, moving Chicago a couple of hexes west in the process. There is an overlay for hex D20, which makes the hex north east of the NYC base a value 20 station in a grey hex. There is one additional train of type ‘2’, ‘3’, ‘4’ and ‘5’, and eight ‘7’ trains, which cost $830 and replace the Diesels. You cannot trade in a train for a ‘7’ as you could for a Diesel. There are also a few extra tiles - one extra 57, one extra 15, and two brown tiles that are the same as a 15 tile and valued at 40. These brown tiles are not numbered, but the design has been used in a number of games and is identical to tiles 448 (1854/1889) and 776 (1860). These maps are based on random maps produced by the 1830 computer program. The maps produced by the program can be very unbalanced, so Wolfram used those as a starting point and then reworked them to get a better balance. I have a number on order from Wolfram, but don’t know quite when to expect them. Half of those are already reserved. If you’re interested I’ll be selling them for £20 plus post and packing, which is about the same price if you buy directly from Wolfram. It’s quite light, so post and packing should be£4 at the most for the UK. Let me know if you want a copy. I’ve been unable to locate any further details on Wolfram Janich’s Nickel Plate variant. I’ve been unable to find any further details, especially regarding the rules. I’ve assembled a PDF of the rules for the Westpark Variant. Eddie Robbin’s Baltimore & Ohio is the latest member of the Historic Railroads System and is part of the Winsome Games’ 2009 Essen Collection. It is a particularly trenchant perfect and certain information game all about timing, timing, and well, timing. In broader character, Baltimore & Ohio is Rimsky Korsakov‘s Flight of the Bumble Bee: full of little surges and races, layers upon layers of them, never relenting, always rushing, all of the races critical and requiring full attention and an endless delicate dedication to the dance. Baltimore & Ohio has been described as the Historic Railroads System meets the 18xx, and there’s some truth to the claim. Functionally it is clearly a member of the Historic railroads System with a hex-map, track abstracted to putting a cube in a hex on the map, companies with shares, company dividends a function of company cubes in cities, etc. Architecturally Baltimore & Ohio is a child of 1825 Unit 1 (and 1825 Unit 2 and 1825 Unit 3) with a glaring focus on (1825-style) portfolio management and timing (owning the right shares at the right times) rather than 1830-style market manipulation. Spiritually, and yes the parentage is this complex, Baltimore & Ohio is the direct descendant of Lokomotive Werks1 with all of that game’s extra-ordinary attention to exacting cashflow, turn order, and timing – just carried forward into a larger and less relenting game2. Of the three, Lokomotive Werks has the dominant genes, shortly followed by 1825. The game itself consists of stock rounds alternating with a pair of operating rounds. Initially 6 companies are available (B&O, B&M, C&O, NYC, NYNH&H & PRR). Later in the game 4 more companies become available (Erie, IC, Nickel Plate & Wabash). During stock rounds players acquire shares and manipulate the stock market. During operating rounds companies operate and may generate dividends for their shareholders. The game ends at the end of a set of operating rounds in which the highest level train is purchased (common), or when a share price reaches $375 (unlikely). The winner is the player with the largest net worth (portfolio value plus cash). There are few surprises here. The board is rife with layers of short and long (timing) races. The number of companies allowed to connect to a given city is equal to the size of the largest train purchased by any company, thus there are races to get to more desirable cities first, locking other companies out. As city-capacity increases immediately when a new level of train is bought (and track is built after train purchasing), there are also races to be in position to buy the next size train and then immediately fill the newly accessible more-valuable cities. There are also races for special locations on the board with dividend-increasing coal tokens. As companies operate in descending order of stock value, stock rounds easily become positional dances attempting to force advantageous relative operating orders for specific companies so as to get them the good cities, good trains, good coal tokens etc4 before some other company does5. Similarly, as there is such an advantage to being marginally lower in cash at the start of a stock round (to get first dibs on the best shares), there is often a muscular struggle in the operating rounds to run companies to pay as much as possible while having the controlling player end up with $1 less than the other players so as to secure the better turn order in the upcoming stock round. This latter turn-order positioning is made more complex by the difficulty of increasing company stock values. There is a strong incentive to run companies for less than their maximum dividends so as to ensure stock-price increases by reserving future dividend increases by counting not-as-good cities for a dividend and then swapping in better cities in future dividends6. Getting the dividend sub-reporting for continued stock-value increases combined with maximising personal cash while also securing good turn order positioning can be difficult. Those are not the only timing layers. There are yet more at different layers and levels, all open to inspection and manipulation. One trick is to hide cash in increased share value which would otherwise affect the player’s turn order. As companies are incrementally capitalised as their shares are bought, and all shares sell for the current stock value, there is not only a race for good operating order, but for various combinations of good turn order positions, operating order positions, good board positions/access, etc. For instance, the right new company floated at the right time, with the right par and thus the right capitalisation, and thus the right operating order (even after player-market assault), can pay great dividends while preserving the player’s turn order position, and be ripe to be dumped immediately in the next stock round, capitalising either buying all the best shares or floating a new company with the right par and the…etc. As another example, there are also timing games that can be played with trains. In one of our games the NYNH&H, a very small company that can only reach 5 cities, already owned two 3-trains and had enough money in its treasury to buy an additional 5-train. Of course that gave it a total train capacity of 11 when it only connected 5 cities, but no matter. It then withheld its dividends and in the next operating round sold its 5-train to the bank7 and used that money along with its remaining treasury to buy the last 5-train, thus selling a 5-train to buy a 5-train and accelerating the end of the game while also leaving an opponent’s company unable to afford the larger train it needed and thus forcing it to withhold dividends yet again. Similar little timing games around the trains exist through-out the game. All the little races and plethora of timing games, with every detail counting, sum to a larger fight to control the pace of the game and thus the length of the game. However rather than game-length being the defining centre of the game as it is in Wabash Cannonball, it is more an emergent and less directly-controlled property formed by the amalgam of all the little races. Due to capital concentration, ability to control the game’s development speed and thus length with lower player counts is greatly reduced. For the same reasons, the importance of game-length control, and the ability to affect it, also tends to increase as player-count increases. Baltimore & Ohio scales across player counts similarly to the 18xx. As player-count decreases, control increases and the timing games may be played with ever-increasing finesse. As player count increases, capital is diluted across players, and control not only decreases but shared-incentives becomes more important and a whole new layer of emergently collusive timing games become possible. At the higher player counts the patterns start to stylistically resemble 6-player 1830’s, and at the lower player-counts, to likewise resemble 3-player 1830, complete with not only the different pacings, but the different values of different companies at the different player counts. The result is that 3 players plays very differently from 4 players, which in turn plays very differently from 5 players (I’ve not tried 6 players yet). Expect your first session of Baltimore & Ohio to take between 4 and 5 hours, possibly a little more. With experience that play-time can be shortened down to around 150 minutes, but it will require both skill and discipline as with that increased skill comes greater ability to predict, control and thus play with the many many layers of timing in the game, pushing the game back up toward 4-5 hours. Perhaps surprisingly it is easier to push play-time down with increased player-counts, as with more players timing-control also decreases, making a great many of the more subtle and time-consuming timing games unviable. No accommodations have been made for maps with different numbers of rounds per player count, or the insta-production rules used on most of my maps. Enjoy. 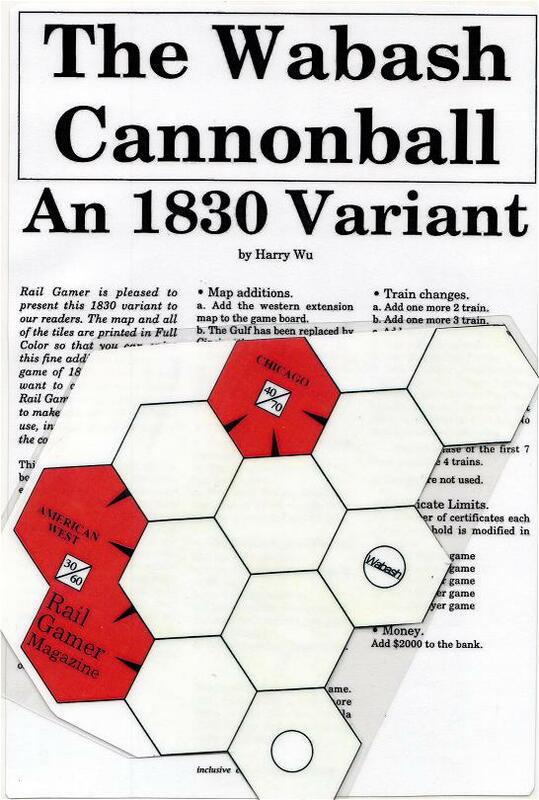 Note: This article was also posted to Boardgamegeek at Wabash Cannonball set piece: #2. Was Player #3 right to force-win that share of the NYC or should he have let it go to another player instead after enforcing a minimum bid level? What did Player #3’s choice to force-win the NYC share do to his position? What does each player do for their first action? Is this an easy or automatic decision for each player? Why? For each player, are they in a good or bad position? What are their primary risks and opportunities? Compare and contrast their positions. Have any of the players adopted game-length postures yet? Have any decisions been made which will affect how many General Dividend are likely to be paid in this game? If so, what were they?